After a long day of sightseeing in the historic center of London Saturday, Mike and I opted for a more relaxed stroll through one of London’s most beautiful neighborhoods, Notting Hill, on Sunday. With so many amazing things to do in London, I had never made it out to this part of town, but it has always been on my must-see list. It was so nice to finally have the time to explore this colorful neighborhood. You can easily spend an entire day strolling through Notting Hill’s peaceful residential streets, sipping cappuccinos in cute cafes, reading in one of the many gardens, antiquing on Portobello road, and indulging in some fine dining. I am sure you have seen lots of pictures of the adorable and colorful houses of Notting Hill online. And it truly does not disappoint in person. Since the neighborhood is quite large, I tried to do some research online before I left. I was frustrated, however, to find lots of pictures of the pink, blue, and candy-colored houses I was hoping to see, but no one revealed where to actually find these colorful gems. I tried to do some Google street-view detective work, and I did end up locating some of the houses I had seen online, but I felt like I couldn’t find a good guide or walking tour… So I made one! 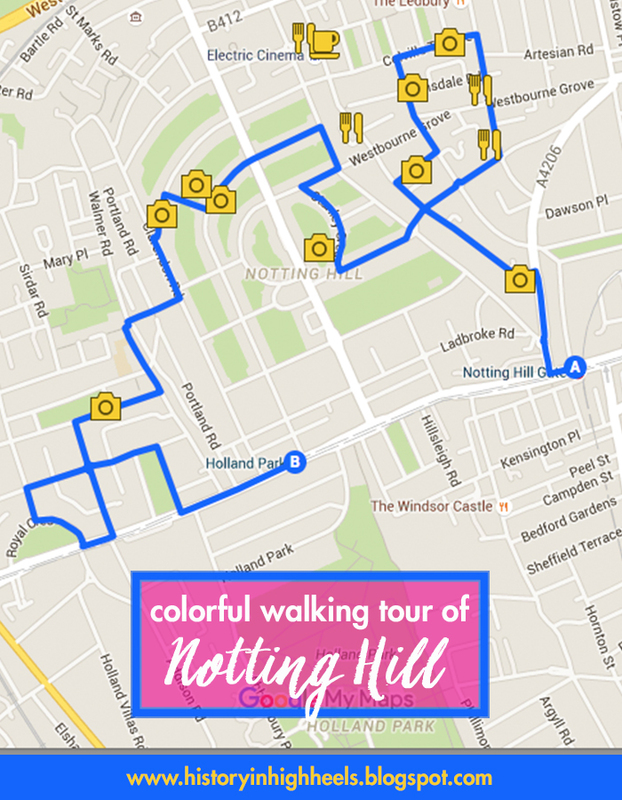 Thanks to my new obsession with creating custom Google maps, I mapped out a delightful walking tour of Notting Hill that highlights, what are in my opinion, the cutest and most colorful streets (that I could find), in addition to my favorite (or highly recommended) cafes, restaurants, and gardens. You can view and download the map here. And don’t worry, I made sure that the location of every colorful photo pictured in this post was marked on the map. Enjoy! Thanks for the post. People who are really concerned about their next traveling destination may take help from the detailed road map so as to make it quite interesting. In my last trip I used the detailed Spain Road Map so as to make it more interesting and cut off my traveling cost. Wish I'd seen your post sooner. I just came back from my London trip and walked like crazy in Notting Hill to see the colorful houses but with no luck. Oh no! I was so afraid that was going to happen to me too. At least now you have a reason to return! Thank you for this very useful map !! Thanks a lot for sharing I use beautiful London locations for personal branding portraits for my clients, and these are just the perfect background.